A cat tree like an enchanted castle straight out of a fairy tale, with towers, a staircase and everything your cat needs to stimulate her playful imagination! The extra-high, parted sisal posts give plenty of place for wild chasing and scratching games. The castle stairs lead between the two different levels featuring a smaller and a larger sleeping chamber. The three castle towers provide excellent view points acroΒ the whole feline kingdom. 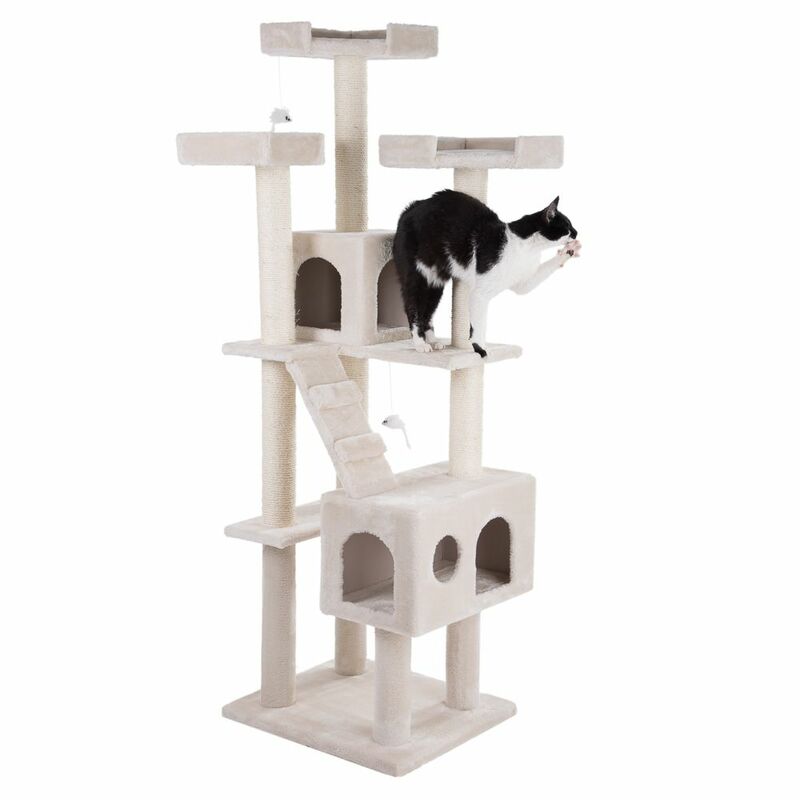 The Rapunzel Cat Tree at a glance: Sturdy cat tree with lots of places to sleep Also suitable for large-breed cats and multi-cat households Colour: dark grey or cream Total dimensions: 60 x 50 x 181 cm (L x W x H) Max. space required with protruding platforms: 70 x 62 x 181 cm (L x w x H) Base: 60 x 50 cm (L x W) 1 large den: Total dimensions: 50 x 30 x 30 cm (L x W x H) 2 entrances: 17 x 20 cm (W x H) Window: Diameter 12cm 1 platform for use as a climbing aid: 50 x 20 cm (L x W) 1 staircase: 39 x 17 cm (L x W) with 2 stairs 1 small den: Total dimensions: 30 x 30 x 29 cm (L x W x H) 2 entrances: 17 x 19 cm (W x H) 3 platforms with edges: Total dimensions: 34 x 34 x 8 cm (L x W x H) Sleeping area: approx. 31 x 31 cm (L x W) Cushioned sleeping area 2 rattling plush mouse toys on a rubber cord: body approx. Diameter 4cm 6 sisal posts: Diameter 9cm 3 x 47cm 3 x 32cm 4 plush-covered posts: Diameter 9cm 2 x 46cm 2 x 33cm Please Note: This product cannot be delivered to Northern Ireland. Please Note: As with any other product, please check regularly for any damage, loose joints or screws and replace the item if it is damaged or defective to avoid potential injury to your pet. Price just £64.99! Click here to buy now!